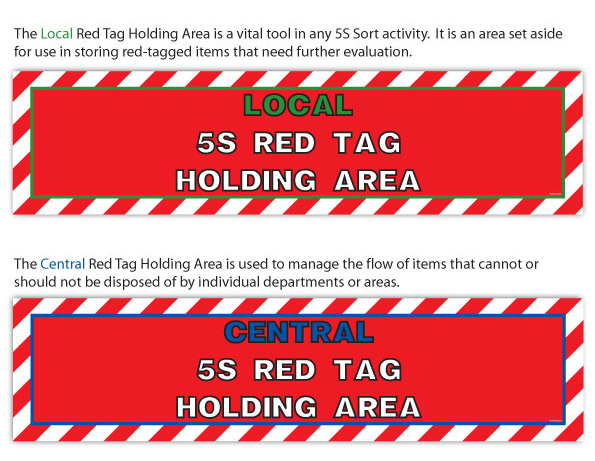 In order to implement your red-tag strategy effectively, a red tag holding area must be created. A red-tag holding area is an area set aside for use in storing red-tagged items that need further evaluation. Use our range of 5S RED TAG HOLDING AREA foamex signs and PVC banners to clearly indicate to personnel your holding areas. Usually an organisation that is launching a company wide red tagging effort needs to also establish and clearly identify a ‘CENTRAL’ red tag area. This area is used to manage the flow of items that cannot or should not be disposed of by individual departments or production areas. 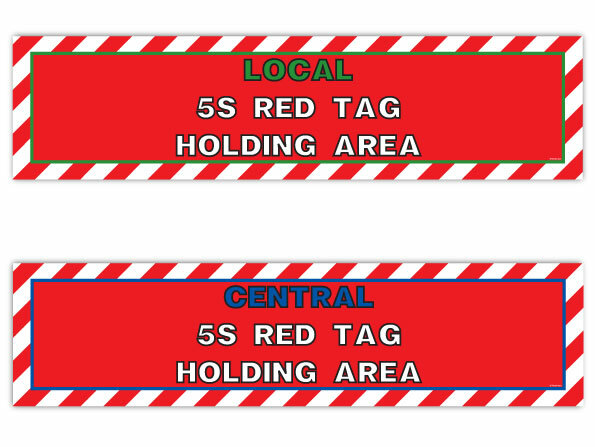 In practice, obeying this methodology of ‘LOCAL’ and ‘CENTRAL’ red tag areas, prevents any upset throughout your factory and prevents anyone from a department making the incorrect decision about an item (acts like a buffer). Made from durable Foamex board (signs) and heavy duty PVC (banners (4ft x 1ft & 8ft x 2ft)), these products are designed for harsh industrial environments. They’re resistant to solvents, oils, greases, fuels and other potentially damaging compounds, as well as being suited to outside environments. Professionally designed artwork that grabs attention and educates. All suitable for use indoors and outdoors.